Potential design for the towering art project. The size is proportionate to the real sculpture. 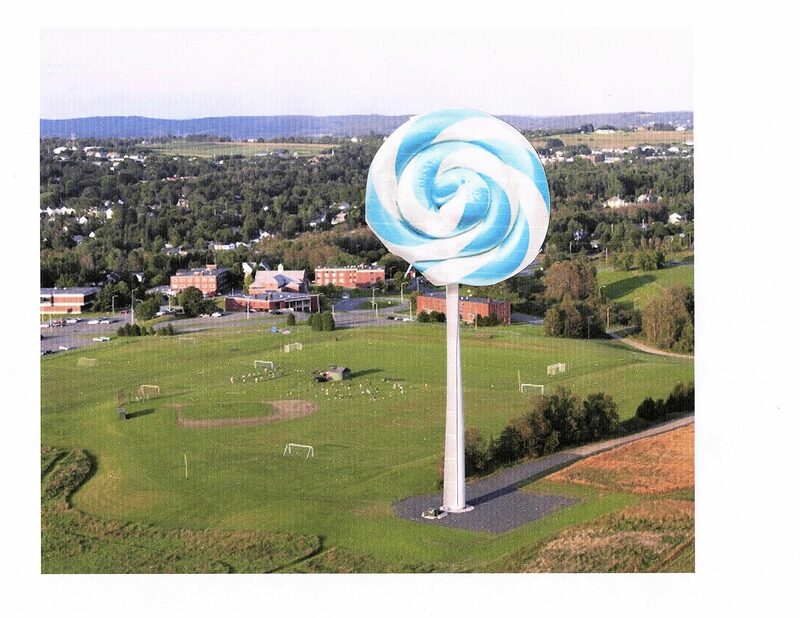 University of Maine at Presque Isle art students are licking their lips in preparation for their newest project: a 50-foot lollipop sculpture. The sculpture will replace the wind turbine that caught fire last year. The project is projected to take 8-12 months of work to complete. The size of the candy will be approximately 30 feet in diameter. The frame of the sucker will be built using a steel frame, canvased with large—but thin–sheets of aluminum. These wrap around the structure as if they were papier mâché. Welding students at the Vocational Center in Caribou will be assembling the frame as a whole. Once construction is complete, helicopters will carry the large metal structure to the UMPI campus. The helicopters will carefully lower the candy cage onto the windmill’s tower. Then trained welding experts will make it permanent. “Whenever we work at high elevations, there are trained professionals involved. Presque Isle Fire is always happy to help. In addition, they keep paramedics on call,” Benjamin Shaw said. Shaw is UMPI’s chief business officer administration and finance. He will be securing finances for the project on top of overseeing construction. UMPI art students will decide on the lollipop’s “flavor,” as well as any aesthetic touches they wish to include. Items up for discussion are: hair stuck to the candy, a crack through the middle showing a bubblegum center and the color palette that will be used. Peppermint is the leading contender due to winter’s consuming a large part of the year. Students at UMPI have no need to fear sugar-rush or feeble dental hygiene. Fifty gallons of sugar-free primer will coat the sculpture. And should you need a reminder to brush your teeth? Just look to the southwest. The big lollipop in the sky ought to jog your memory. Previous Previous post: Is the Sky Falling?